From the 4 Danzas from the ballet Estancia by Alberto Ginastera, a music video directed by Marco Cassini, featuring Sara Centorame. The music was transcribed by Martina Colli for the exclusive use of the Colli&Rubini Duo. A dancer, whilst walking through the streets, suddenly hears the music and follows it. She eventually finds the duet: captured by the energy and the spirit of this piece, she starts dancing. We see the girl and her intense movements in the crowded Piazza Fontana di Trevi, along the silent, narrow streets of the centre, inside a cafe anf around the Palazzo del Quirinale. Her dance grabs the attention of everyone and the music permeates the air. Here me at the age of 6 in Italy, at my first official performance! My father suggested me to pretend I was alone in my living room, playing as usual. 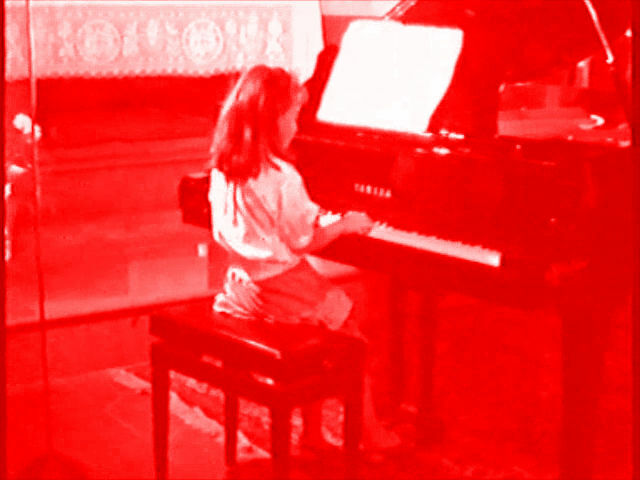 My piano teacher asked me to give importance to the start of the piece, moving elegantly and gently. Here is how I mixed the two ideas! The ArtEx project gave me the fantastic opportunity to work with a visual artist, Tamarin Norwood, and a composer, Enrica Sciandrone. We enjoyed our co-operation together, so much that at the end of it we said each other goodbye looking forward to doing it again! Two Italian pianists are here playing the famous Ouverture of La Gazza Ladra by Rossini. Can you tell me if you hear the Rossini’s crescendos which are one the reasons he has been very popular for? Musics for Total Potemkin have been composed to comment and accompany visitors watching Ben G. Fodor’s pictures. It’s structured like photographs, because many episodes follow one another, sometimes coming back again, as a visitor watching a picture once more or linking them with thoughts. Each episode expands a rhythmic motif, a sound effect or a simple structure. The tension is unpredictably going up and down, the patterns are interrupted or elaborated again, the piano keyboard is used by its entire range. Composing this music meant not only making up all these fragments but also mixing them to create a significant process, swinging between human and nothuman confines, represented by tension and elaxation times. In a world where divergences of mankind brings desolation and loneliness, the universal language of music bears once again hopes and moves hearts.